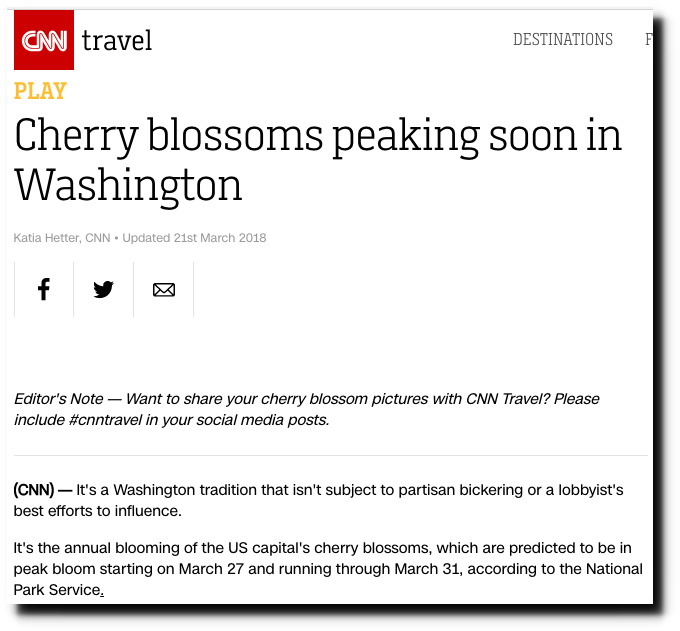 Climate experts say Washington DC cherry trees are blooming earlier due to “global warming” and predicted that peak bloom this year would be March 17-20. 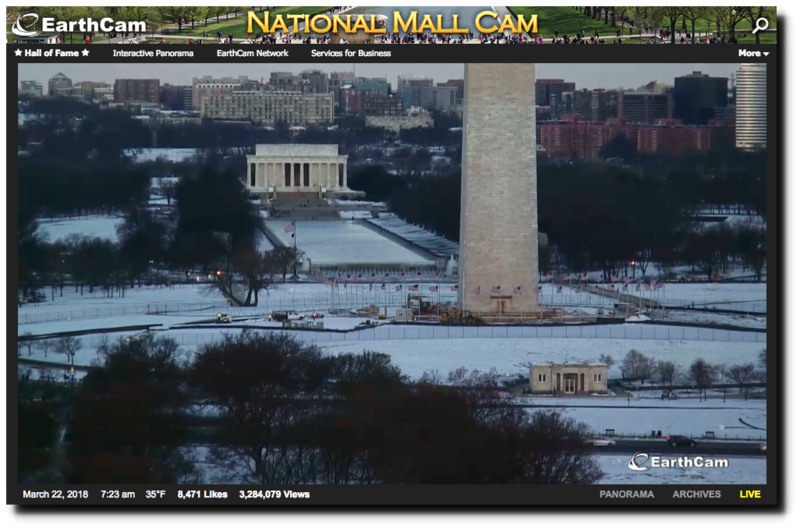 It is March 22, and Washington DC looks like mid-winter. Perhaps all of the white stuff on the ground is fallen cherry blossom petals? But not to worry! 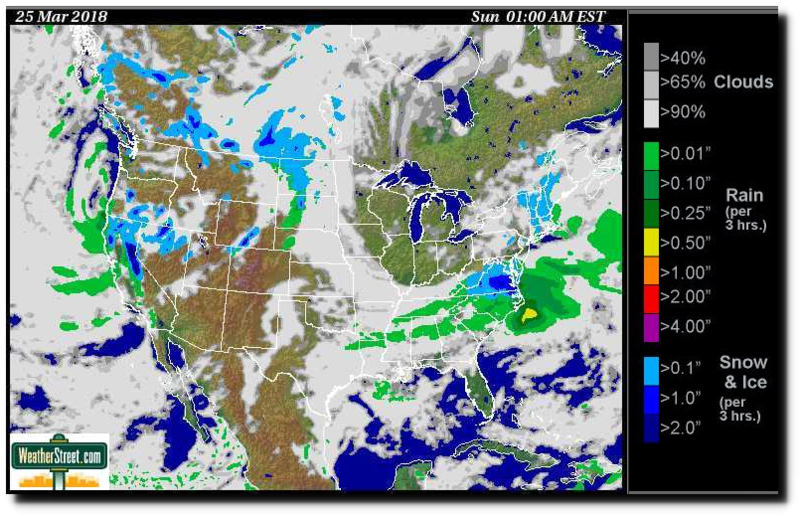 Experts have updated their failed forecast to March 27. Just in time for the next snowstorm in DC. 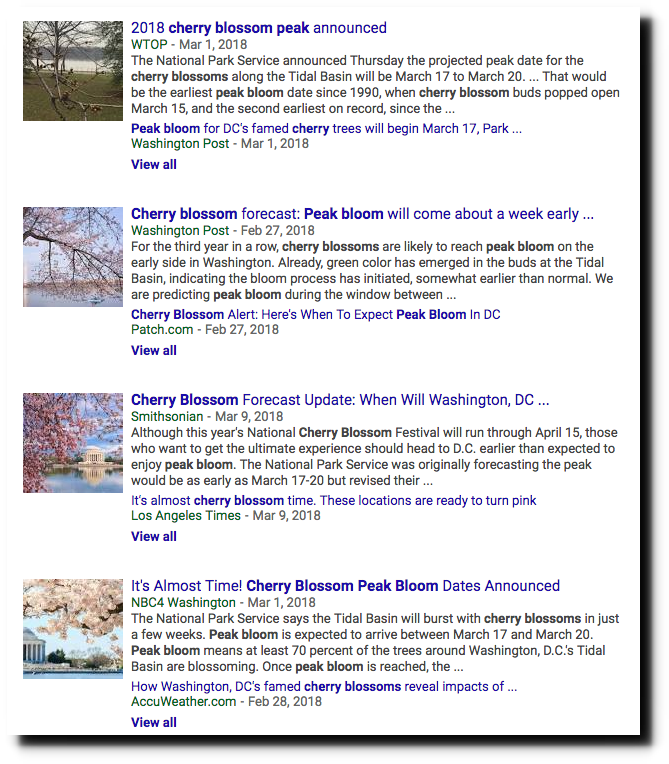 Cherry blossom bloom dates have been trending later in DC, not earlier. But climate experts cling to their illusion that CO2 controls the climate and are thus blinded to reality. Climate is climate, and climate science is nonsense, and never the twain shall meet. 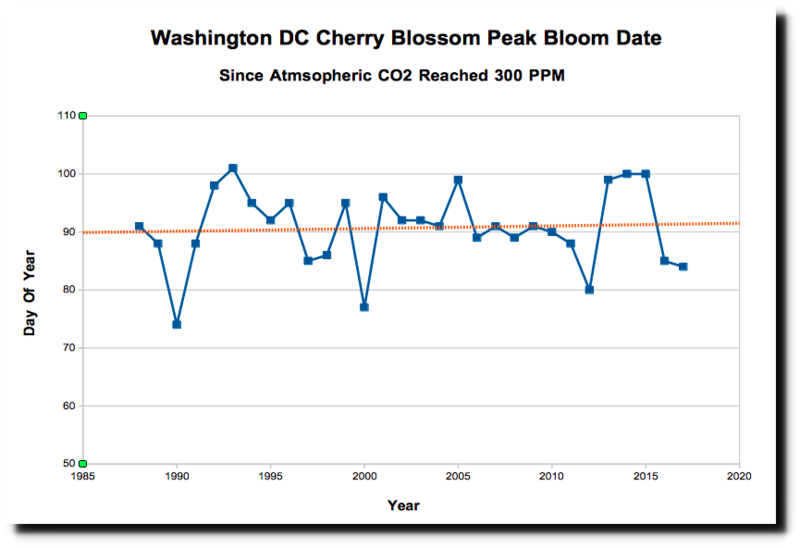 Experts believe cherry trees are going to start blooming in January, in spite of the fact that the concept is ridiculous and there is no evidence to back it up. March temperatures in the DC area show no long term trend, but recent years have been generally cold. 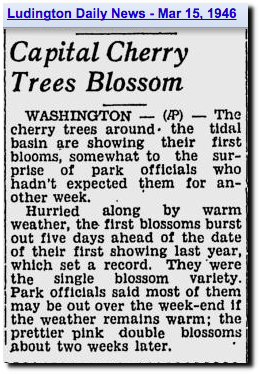 It wasn’t always cold in DC during March though – 1945 and 1946 had very early blooms. 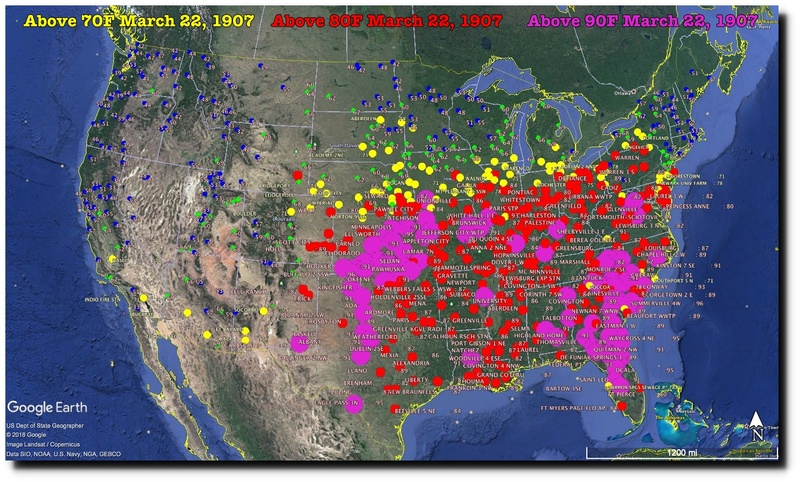 Prior to 1950, March 22 was frequently a warm day in the US, with 1907 and 1910 being the warmest. 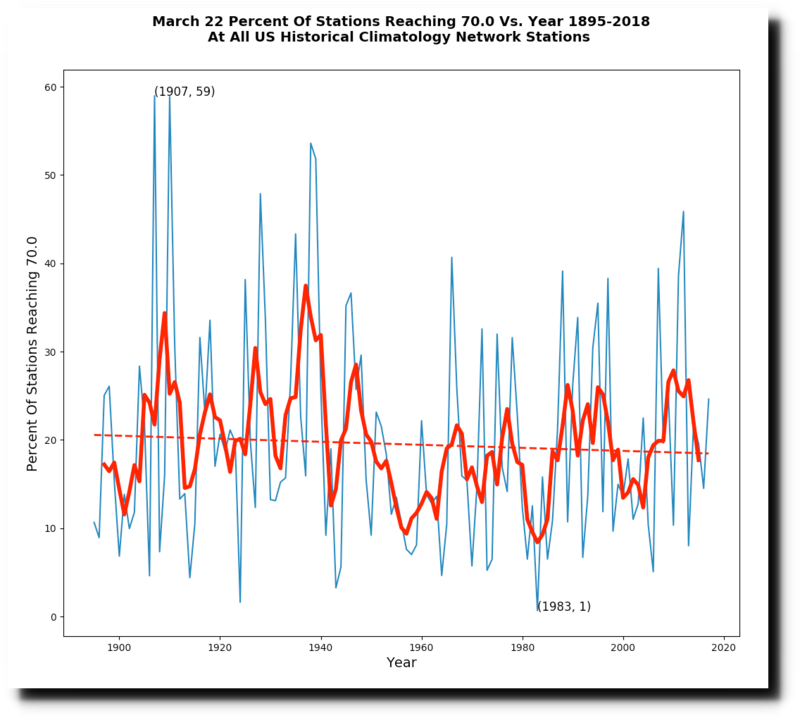 During those years, 60% of US stations were over 70F on March 22. 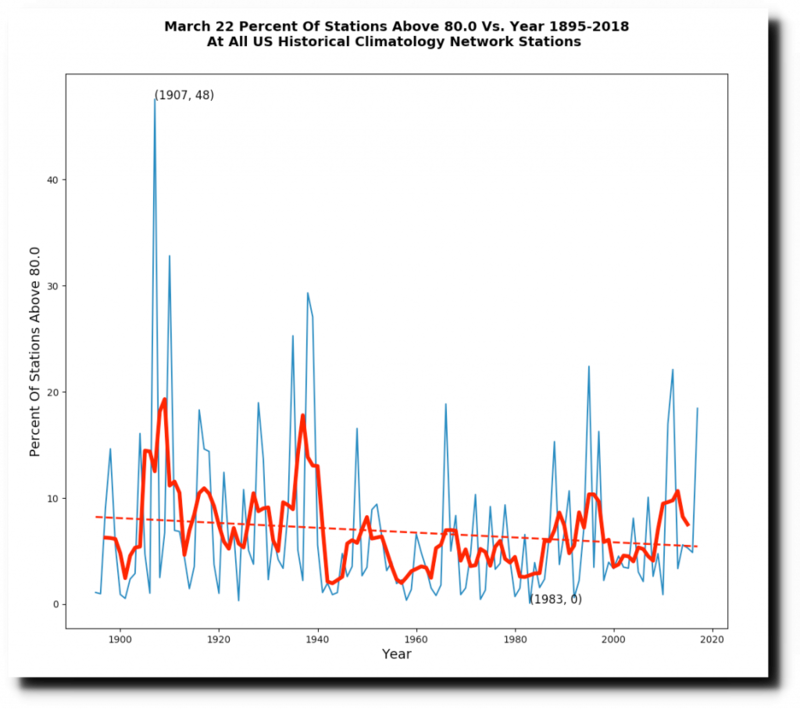 There was a sharp drop off in the frequency of March 22 eighty degree weather after 1940. On March 22, 1907 much of the southeastern US was over 90 degrees, and 80 degree temperatures were widespread as far north as New York. The belief that CO2 controls temperature is the most embarrassing and mindless mass superstition of the modern age. It’s mind-boggling. “Mass superstition” is a good term for it. But what is causing it is still a mystery. Why would so many seemingly normal human beings choose to ignore the obvious and believe the opposite? They are simply too lazy to check it out for themselves, preferring instead to believer the “experts”, the high priests. Don’tcha know that this cold, snow and delayed start of spring are also caused by global warming? I thought everybody knew. 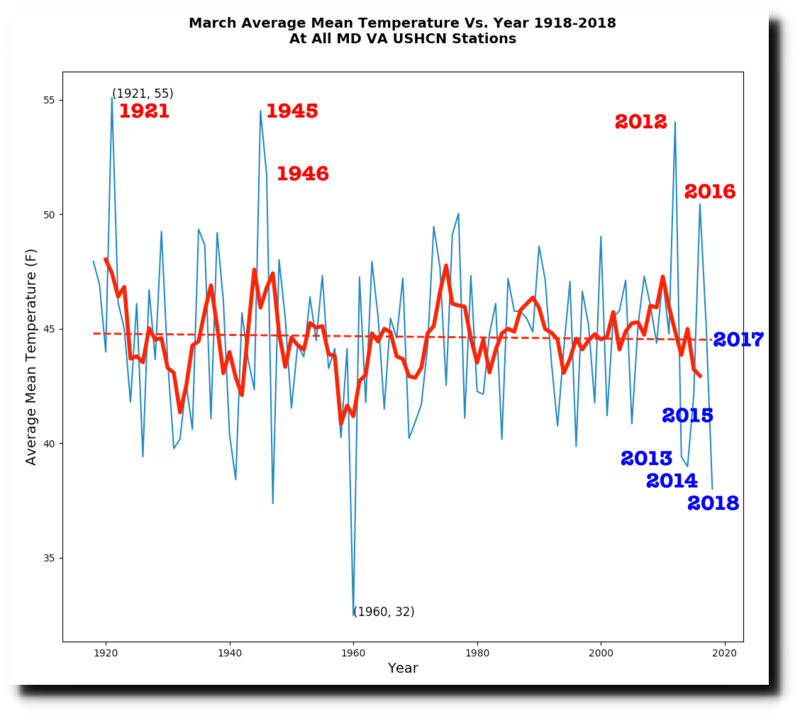 Global warming is the underlying reason why spring comes early, just right or late to Washington, DC. You need to read more climate science news. It’s like sports. Even though you aren’t athletic enough, or are too lazy to get better, you can always follow your friends and simply root for your favorite team. No matter how bad they are you’ll still support them. Yeah, but it would get much better if they allowed me and my friends to run the team! Well, just me, really. My friends are full of it. What do the red line and blue line represent? I put together a spreadsheet based on snowfall (winter months) in my area after collecting 29 years of data for Environment Canada, and the trend has been going up (wild swings though), but it surprised a snowmobiler friend of mine who figured we were getting less snow….he was very surprised…. Someone on some blog yelped a couple of weeks ago that the cherry bloom would be over before April. I live fifty miles due south of DC. So I walked around my property checking cherry trees. I checked my fruiting cherry trees. I checked my flowering only cherry trees. I checked the wild cherry trees. While the buds are visible, they have not swollen yet. Two weeks of very warm spring weather might bring about flowering the first week of April, but I doubt it. A major problem with this year’s winter in Virginia and around DC Metro is that while the winter has been cold, there have been a few, very few warmer days. Yes, a couple of days hit record temperature potential, but only during the day. Even those warmest winter days had cold temperatures at night. With the result that plants stayed dormant. There are a few trees around here with some flowers on some branches. Those trees are sheltered from north winds and very open to midday and afternoon sunshine. Which does not prevent them from looking odd as a substantial part of the tree is not flowering, yet while a few, most exposed to sunshine, branches are flowering. My daffodils have not flowered and the most advanced few are still a week away from flowering. My crocuses are just finishing up. Forsythia is in bloom, which is quite normal at this time of year. Redbud trees have swollen buds, but no flowers yet. Some representative of good government should sanction National Park Employees for spinning falsehoods.